The purpose of a garden focal point is to bring the garden into focus. What may start out as just a grouping of plants is given definition by a focal point. Viewers instantly know where to bring their attention. You may have heard this referred to as directing the eye or giving the eye a place to rest. It's the same concept that we use when designing indoors. Objects of size or interest, like a fireplace, piano, armoire, painting or large screen TV, are positioned to be the first thing you notice in a room. The rest of the furniture and objects are used to balance and accent the focal point. 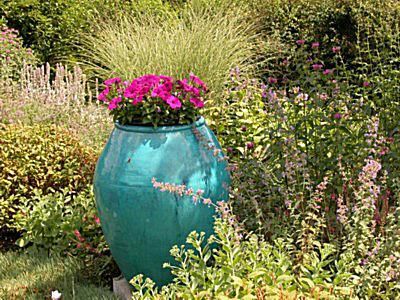 Do you need a focal point to have a garden? Of course not. Focal points are just design concepts that can be used as tools when creating a garden to your liking. If you choose to surround yourself with masses of individual plants, collections of plant specimens or comfortable garden chaos, it's still your garden. If you do choose to play with creating focus, the choice of garden focal points is limitless and personal. Anything that offers interest through size, shape or color will serve as a focal point. You may have more luck if you look for objects you love and then find a place to put them, rather than hunting down the perfect piece to fill a void. Ideally, focal points should look like they have always been a part of a garden. This is not to say they need to be old, or distressed, just comfortable in their surroundings. Placing a focal point in your garden design in general, is largely a matter of trial and error. The more you do it, the better trained your eye will become. What Is Good Garden Design?